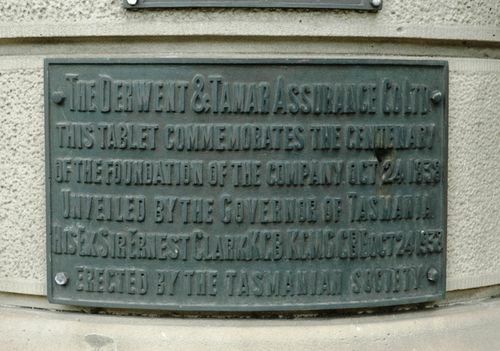 Plaque commemorates the centenary of the foundation of the Derwent & Tamar Assurance Company. The Derwent and Tamar Assurance Company, Hobart, marked its centenary today by the unveiling of a tablet on the building by the Governor (Sir Ernest Clark) and a luncheon at Hadley's Hotel. The chairman of the directors (Mr. P. B. C. Walch) said the company had the distinction of being the oldest surviving assurance company of any kind in Australia. He complimented the Tasmanian Society on its care in look ing after the historical landmarks of the state. Mr. Walch welcomed Mr. T. Haynes, the president of the Melbourne Chamber of Commerce and chairman of directors of Parbury, Henty and Co. Pty. Ltd.. who have been representatives of the company in Melbourne for 80 years. The Governor also congratulated the Tasmanian Society on its enterprise in securing prominence for such historical landmarks. Insurance had been known in England, said his Excellency, for about 250 years, or about 100 years before Australia had been first settled, but it was not until a hundred years ago that it was first practised in this country. Between 1830 and 1840 two insurance companies were formed in Sydney and four in Hobart, while two English companies began operations in the colony. He pointed out that while insurance was now an ordinary business transaction, one hundred years ago it was not easy to support such an enterprise in an infant colony far distant from the centres of business enterprise. Examiner (Launceston), 25th October 1938. This tablet commemorates the centenary of the foundation of the Company, Oct 24, 1838.